Something terrible is coming over the boys at the Center. It's a bad case of the above-the-lip-flavor-saver. 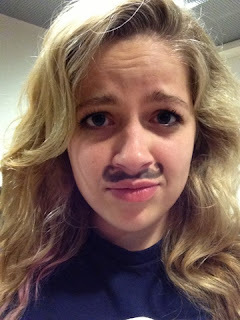 Several of the boys have decided that there is no one worth impressing, and are growing out their mustaches. Despite living in the midst of a culture in which a mustache is the ultimate sign of manhood, and to be bereft of such is to be stripped of one's dignity and masculinity, our Arabic teacher does not have facial hair. He says it is because his wife hates it, and he is happy to make his wife happy, but I think otherwise. Last week he was making derogatory remarks about the well grown mustache of my classmate, Sawyer. The joke's on him though- no one hates on Sawyer's mustache. No one. In show of solidarity, we decided to grow our own mustaches. Myself included. Our teacher hated it, of course, and wanted us all to leave the classroom until we were "clean shaven." I think I looked pretty fetching. And the best part about it? It's Honor Code Approved.